La Habanera with Zarah Leander and Ferdinand Marian. First, I have to state that I watched Douglas Sirk's La Habanera, not knowing what to expect. All I knew was the brief synopsis on the DVD box. I also knew that Sirk was a director of such lush 1950s Technicolor soapers as Magnificent Obsession, All That Heaven Allows, and Written on the Wind. None of which would ever appear on my “favorites” list. 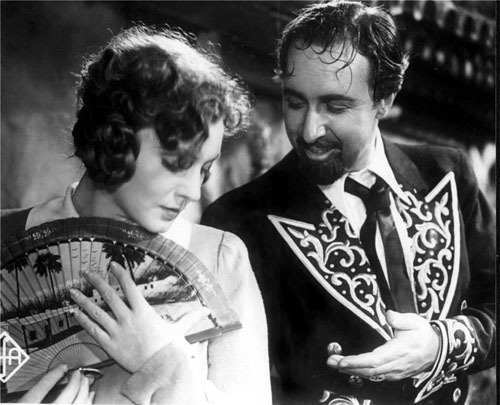 But La Habanera was produced in Germany in 1937 in black and white, and starred an actress I had heard about – Zarah Leander – but had never seen before, so I gave it a try. I was in for a pleasant surprise. Astree Sternhjelm (Leander) is a lovely, young Swedish woman on holiday in Puerto Rico, with her aristocratic Aunt Ana (Julia Serda). The film opens by showing how the two women differ in their impressions of the vacation. Aunt Ana keeps complaining about the “savages” and the heat and the inferior conditions in her hotel room, while Leander's Astree is wistful and enchanted by everything she sees – especially the rich landowner, Don Pedro de Avila (Ferdinand Marian, who would later star in the infamous Jud Süß). Overall, Astree is an impressionable, free-spirited girl who appears to be under the magic spell of a lovely island and one enchanting song, “La Habanera,” that the gypsies sing. On the last day of their visit, the two women attend a bullfight, and we get to see all the blood, violence, and cruelty that the practice involves. Astree is in the spirit of the action and enjoys herself, while Auntie continues to complain, “I am so grateful our ship leaves tomorrow.” I admit, I liked this stuffy old bag – and agreed with her about the bullfight. Serda was given some very funny lines and her fussy character was someone I could understand. The morning arrives and the visitors get onboard the ship. But there is a faraway look in Astree's eyes as she thinks of Don Pedro and what an enchanting life she could live in Puerto Rico, far away from Sweden's cold, austere, rigidity. She impulsively exits the ship and finds Don Pedro waiting for her. Next, the story shifts to Sweden, ten years later. The Aunt meets two doctors, Luis Gomez (Boris Alekin) and Sven Nagel (Karl Martell), who announce they are traveling to Puerto Rico to investigate the cause of a deadly fever that is killing the residents there. Dr. Nagel had been a former boyfriend of Astree at one time. Auntie engages him to bring her niece back home with him, and he agrees. Meanwhile, back in Puerto Rico, we find Don Pedro addressing his contempt for Astree to an empty room. All he sees is her wedding dress, and he slices it with his knife. Astree enters and confronts him. He is hostile to the fact that she won't let their nine-year-old son, Juan Jr. (Michael Schulz-Dornburg), go with him to witness the kid's first bullfight. It seems Astree now wants nothing to do with her husband or her adopted culture. She insists that their son grows up to be Swedish and that she will return to her country with him. She even makes reservations for them to leave by ship, but Don Pedro learns of the deception and cancels her plans. Instead, he suggests they go to Sweden together. She refuses. Her reaction, I must say, left me puzzled. And this is where I got critical of the story. We see no slow deterioration of their marriage and we have nothing on which to base her change of heart. In the earlier sequence she thought her new life was “heaven”, now she calls it “hell.” Just exactly why, we don't know. What we do see is that her son has become her surrogate husband. In fact, they have a relationship that borders on the incestuous; always kissing and fondling each other. The other mystery is that her son comes down with a fever, but it apparently has nothing to do with the island sickness that is a big part of the parallel story. The doctors appear under the watchful eyes of the authorities, who refuse to acknowledge that there is a dangerous illness on the island for fear of alienating tourists. Don Pedro is a part of the group that is keeping the disease a secret. After the two doctors take blood from an infected man and create a cure for the disease in their hotel room, Don Pedro invites them to be guests at his house. Meanwhile, his men break into the hotel room and destroy the serum. I couldn't help but feel manipulated by this. Now, I thought she had changed again and decided to remain on the island with Don Pedro. Does she want to leave, or not? She had spent hours indoctrinating Juan Jr. with Swedish culture and language, and filling him with promises of taking him to the land of snow. But now she declines all offers to leave. But more surprises occur when Don Pedro suddenly catches the fever! (It seems people drop dead within minutes of the onset.) The only cure for the illness has been destroyed by his own orders, so he dies. Leander changes her mind once again, and agrees to return to Sweden with the doctor and her son. I was hoping there would be a trick ending, with her escaping ship again and staying on the island. Now, after watching La Habanera I read information about its history and I've since learned to see everything that happens in it on a different level. La Habanera was produced in Nazi Germany, only a few years before World War II. Seeing it from that perspective, I come away with a story that has ethnic overtones and a bit propagandizing. The Puerto Ricans are seen as instigators who prevent the good Aryans from curing a deadly disease; they die in the process through the character of Don Pedro. The child, born of a Swedish woman and a Hispanic man could not be any blonder or whiter. He is a replica of pure Aryan blood. Sweden is civilized because it is white; Puerto Rico is vilified because it is brown. That could be one interpretation. My own personal impressions, however, were more from a cinematic standpoint. Franz Weihmayr's crisp, clear cinematography is stunning with its complementary play of lights and shadows, while Sirk's handling of the subject is so intense I never lost interest. Additionally, Gerhard Menzel's screenplay is full of humorous situations. Besides the very funny Aunt in the early scenes, there is an amusing sequence about a hypochondriac who corners Dr. Gomez at a party and goes into graphic detail about his gallbladder. I also noticed that Don Pedro's personal servant (Lisa Helwig) was portrayed as a masculine woman with a mustache! But ultimately, all credit must go to director Douglas Sirk (or Detlef Sierck, as he was known in Germany). Sirk had to make La Habanera under the Nazi-controlled Ufa studio, so he had to march in step with the party line. While La Habanera is not explicitly racist, the themes of Aryan superiority are there. At first, there is the lure of the island … something exotic. But that does not last. One longs for a “civilized” culture in the north, where they have snow, instead of fever epidemics. Was this the reason that Astree's marriage failed? I only wish we could have seen that happen on screen. That way, we would have been able to understand her myriad changes of character in the otherwise enjoyable La Habanera. Dir. : Detlef Sierck (a.k.a. Douglas Sirk). Cast: Zarah Leander, Ferdinand Marian, Karl Martell, Julia Serda, Boris Alekin, Michael Schulz-Dornburg.